This was through its international campaign to find the greenest countries, companies, and communities. The leading aluminium and PVC window, door and curtain walling manufacturer and installer received this latest accolade in the ‘Building & Construction’ category. At the special awards ceremony, attended by over 200 people in the Turkish capital, Ankara, CMS was one of several companies representing the UK, following its success in becoming a Green World Ambassador, through having won Gold in the Scottish Green Apple Awards earlier this year. The Green World Awards are organised by The Green Organisation – an international, independent, non-political, non-profit environment group dedicated to recognising, rewarding and promoting environmental best practice worldwide. They aim to better environmental performance, encourage the efficient use of resources and showcase the competitiveness of organisations, as well as supporting the wider goals of sustainable development, including social benefits through community and staff involvement. An independent panel of judges assess entries against strict criteria, including environmental benefit, innovation, commitment, social benefit and future plans and replication potential. 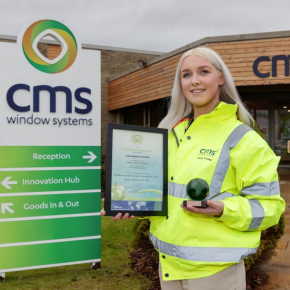 This latest success for CMS follows its triumph in winning a Queen’s Award for Enterprise in the Sustainable Development category in 2017, as well as a Gold award in the International Green Apple Awards for Environmental Best Practice. This resulted in its winning paper being published in The Green Book, the world’s only annual work of reference on environmental best practice, distributed to environment professionals, universities and libraries around the world. David Ritchie, CEO of CMS Window Systems, commented: “We’re delighted to become a Green World Ambassador and are grateful to the organisers for giving us the opportunity to share our experiences and best practice with other like-minded businesses across the world.